If you're crazy over giveaways and contests as much as I am, you'll love Cwikwin; a new mobile app I have stumbled across last week! 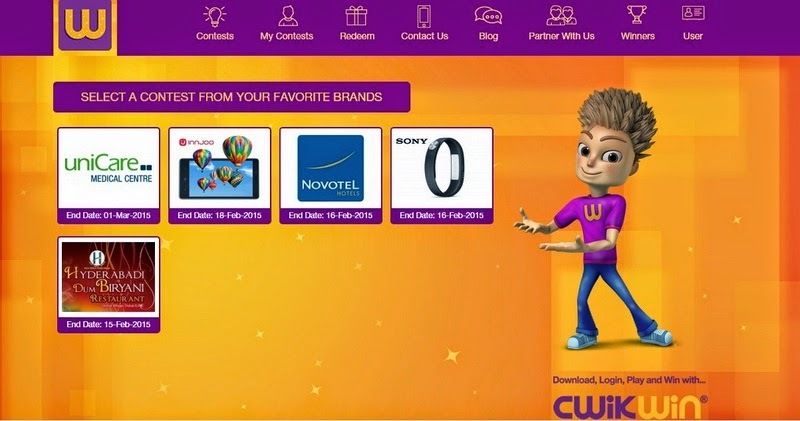 Cwikwin, pronounced as "quick win", is UAE's first mobile application for contests where you can win amazing prizes like a full meal in a restaurant, a new gadget, an event pass and even a medical service! Cwikwin is free to download, registration is fast and easy, and the contests are about the products that you have tried or have been wanting to try! The first time I used the app, I noticed how perfect it is for us, residents of the UAE! Contests are in the form of quizzes. It could entertain you while you're in a long and boring bus or train ride. It could lift up your mood while having a coffee break in the office. And it's something fun to do while relaxing at home. The quiz questions are simple, particularly about the giveaway, and most of all, not time consuming (just right for my hectic expat life)! How can you win with Cwikwin? Well, there are two ways. First, you'll get an entry after participating in a contest. Winners are chosen randomly and electronically. Second, you'll receive 1 point with each correct answer in the quiz. These loyalty points can be redeemed for gifts at Cwikwin's online store! Join the contests to win cool prizes at Cwikwin! For more information, please visit Cwikwin's official website www.cwikwin.ae and Facebook Page. Download the mobile app on the App Store and don't forget to watch the YouTube video down below.